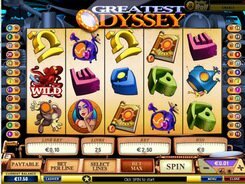 In Greatest Odyssey slot game you come across the symbols of a book, a submarine, an octopus, a lady and a television set. 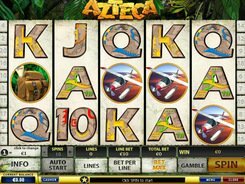 The Playtech developed machine consists of 5 reels and 5 win lines. 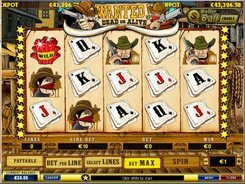 The coin size is changed from $0.01 to $1, with up to ten coins bet per line. The fixed $5000 jackpot is paid out for the combination of five octopuses landed on any activated payline. Besides, the Octopus sign serves as the wild substituting for other regular symbols. 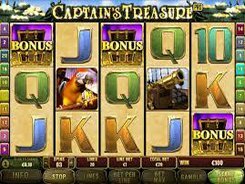 The Treasure Book symbol scattered anywhere on the reels starts 25 free spins, provided three or more scatters appeared. Depending on the number of scatters that have triggered the round, the bet multiplier varies from x2 to x10. Three violet-haired Ladies appeared on an active payline in a consecutive order trigger the bonus game. In the bonus game, you enter the underwater laboratory. Choose 3–5 items and get a cash reward. The number of the items you can select here depends on the number of Lady symbols triggering the bonus round. 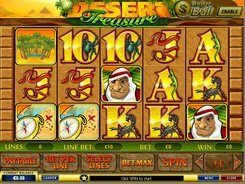 You can try to grab the progressive jackpot, since Greatest Odyssey slot is included in the Dollar Ball progressive jackpot network. But first you need to activate the feature by clicking the Dollar Ball button in the upper right corner. 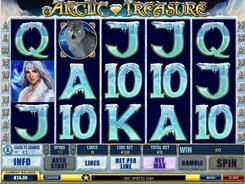 You get the jackpot sum if the five numbers that you have picked match those selected by the slot machine. PLAY FOR REAL MONEY!